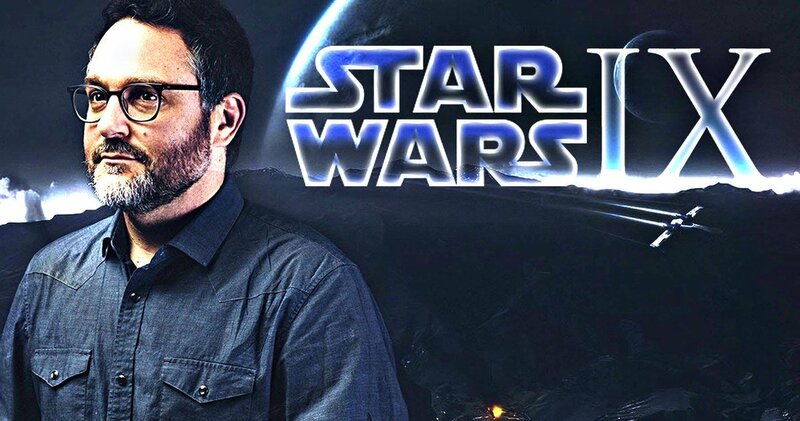 So, Colin Trevorrow got fired off Star Wars Episode IX, after being officially signed to the project for literally over two years, and as of yesterday he has been replaced by Episode VII director J.J. Abrams. Even though plenty of people, including me, feel like this is a significant step up, it's kind of startling how quickly this is happening after the huge ruckus created by the firing of Phil Lord and Chris Miller only three months ago. 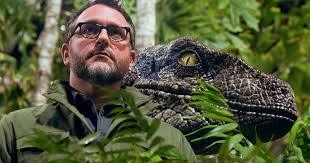 Trevorrow didn't hit my eye-line until Jurassic World was announced. I had heard of his little indie darling Safety Not Guaranteed and somehow it got lost in the wave of quirky, small, smartly written films involving complex relationship stories set against the background of some crazy sci-fi or fantasy premise from around 2010 to 2013. Say, like Seeking a Friend For the End of the World, or Spike Jonze's Her, those kind. But I liked it well enough. I thought it showed promise. I was surprised that Universal would hand off their potentially biggest project of the year to him, but it wasn't unheard of anymore. 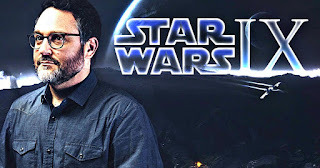 At the time, Josh Trank was being tapped for comic book superhero movies and a largely hypothetical Star Wars spinoff. The guys most famous for the paintball episodes of NBC's "Community" had just made the best Marvel movie yet seen at the time. 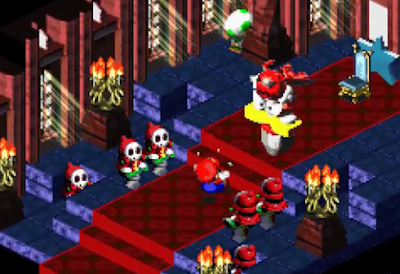 Indie beginnings were a path to the most commercial of giant blockbusters. So far, that method of signing cheaper directors who the studio can keep tabs on has worked out about 65% of the time, by my count. I get why lots of people didn't like Jurassic World. That's fine. I had fun with it, mostly because I've never held any of the sequels in high regard and I feel that if you can't make a smart sequel to the original, your dumb sequel had better swing for the fences at least. And I felt it did. This year's The Book of Henry, Trevorrow's post-blockbuster return to smaller productions, was undoubtedly a garish, weird film that swings plot and tone around the room like a bullwhip. It's a strange attempt at the merging of Wes Anderson, Alan Ball, Carl Hiaason, and the Hardy Boys. But, you know, Spielberg had his 1941, John Carpenter has at least one dud every five to ten years, and Richard Linklater directed that Bad News Bears remake with Billy Bob Thornton. No, that's true. Turns out, filmmakers are always capable of missing the mark completely and making a real stinker. So, yes, it's highly possible that Disney, Lucasfilm, and franchise czar Kathleen Kennedy just dodged the bullet of a half-billion dollar movie that could have been the real black sheep of the series. It's also completely possible that if Trevorrow were collaborating enough with Episode VIII director Rian Johnson on the arc of the story and the necessary payoffs of this new trilogy, it could have been a nice, satisfying conclusion. We don't know that, we haven't seen it and we never will. I cannot judge a nonexistent film based on my distaste for the guy's interviews or his previous work, and ultimately I think it's weird to do so. I want to like things, I want to be excited for a Star Wars film. So I have to confess, I take no pleasure in this news. It's a bad look to fire this many directors in this amount of time, and I'm not glad that a yet another Star Wars project is probably going through yet another rewrite and rebuild, not to mention the army of people who will likely be fired from the production in order to make way for Abrams' preferred crew. And I'd like to know what changed recently to warrant it. Trevorrow was being tied to Johnson in press releases as "the illustrious indie boys who are going to steer the main saga" since August of 2015, and suddenly right before production started to get underway he is gone. What? What did he do or say that was more off-putting and tone deaf than his comments about female directors and white male privilege right around that same time his hiring became official? Because that seemed to be fine with his producers and the family entertainment juggernaut behind them. Like I said, even if this hiring formula works about 65% of the time, think how much money the studio is wasting. And time! Keep in mind that four directors have been fired and one had his film heavily re-shot and re-edited by another director. That's only in the last two years, and only two films have even been released in this grand, decade-long blueprint. That sounds less like Star Wars and more like Warner Bros with their DC movie universe. I find it interesting that one gets much more benefit of doubt over the other, seemingly on the basis of Kathleen Kennedy's legendary career alone (and maybe also on a deep hatred of Zack Snyder, et al). And even with their revolving door of directors, two miserable critical flops released, and whatever the hell is going on with Superman's mustache, WB/DC have still managed to hire and retain Patty Jenkins for Wonder Woman and its sequel. I'm not dismissing Kennedy's sterling track record, or somehow putting this on her for firing these fellows. That's why she's in the driver seat. But I do wish the studio system would have considered this when the hiring trend started. And as much as "creative differences" is always used, this is what it boils down to: studio executives wanted to hire guys like Trevorrow because they are cheaper, they usually express some sort of fan appreciation of the brand assigned to them, and they can't push back against studio notes too hard. It isn't a creative decision. Sure, hiring someone like Lord and Miller to direct your Han Solo movie sounds like an attempt to capture the sardonic humor of the character while not skimping on the complicated action sequences, but that's window dressing. You know how I, decidedly the most outside of outsiders, could know that? They replaced those guys with Ron Howard. Can I talk about something more fun, but somewhat related? Jurassic World is the Jaws: The Revenge of its series, right? Both Jurassic Park and Jaws were groundbreaking blockbusters directed by Steven Spielberg. While one changed the pacing, structure, and marketing of modern day summer tentpole films, the other essentially proved CGI effects were a viable alternative when practical effects fail. Also, both are ostensibly mass-market summer adventures with elements and origins in classic thrillers. Somehow they blend together popcorn flick and prestige film. Now, not everyone is going to agree with me on this, but Jaws II and The Lost World: Jurassic Park share a lot of similarity. For me, both are too-soon attempts to cash in on the love for the first film, and do so with that old-timey, boneheaded refrain about sequels, "bigger, bigger, bigger." Some cast members return, but the magic isn't quite there. It's a perfectly edible reheated leftover of a movie that spends a good amount of time admirably aping the actual skill of Spielberg's storytelling. The only distinguishing thing about The Lost World is that it seems to be Spielberg himself trying to recapture his own sense of scope and wonder, and falling short. That's a mark against it, in my opinion. The third entries of both series tend to be looked at as, ugh, I hate to use the phrase because I am one, but the "redheaded stepchild" of the group. While Jaws 3-D comes right out and announces its tacky nature with the gimmick of the 1980s 3D resurgence and the SeaWorld brand plastered all over the place, Jurassic Park III waits a lot longer to reveal itself as your garden variety dumb monster movie by front-loading it with a bunch of splendid character actors who hopefully got paid over their usual quote. The third shark movie connects to the first with the inclusion of the Brody boys as adults, but is largely populated by horny college kids and action typecasts like handsome Dennis Quaid as your capable male hero and Louis Gossett, Jr. as a gruff authoritarian. A cute connection: an early draft of Jurassic Park III involved a pack of late 1990s teens being marooned on Isla Sorna, which definitely would have made it a certified dumb creature feature. Instead, the film connects to the original with the inclusion of Alan Grant and (briefly) Ellie Sattler, but is largely populated by dead-meat mercenaries and the squabbling, plot-armored Kirby family. Ultimately, while being the really dumb entries, I find both to be a lot more fun than the second. 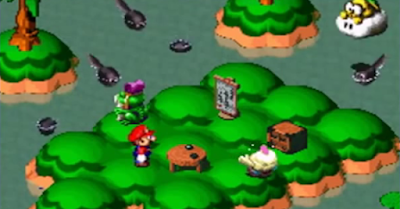 Then we have the fourth, late entries in their respective series. This is where the comparison is spooky. The 1987 Jaws: The Revenge seems to include many new elements to the formula on the surface, but is really the most shameless rehash of the original because instead of winking nods to beloved scenes, characters, or shots, it just decides to announce these references as deliberate fan service. Remember that lady from the city council meeting from the first one? Here she is. No real reason. Remember the great scene where little Sean mimicks his father's movements during a low moment? We're just going to do that again, and then explain exactly what it is in case you don't remember. 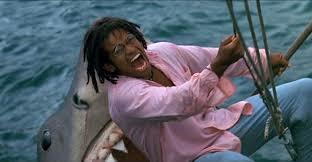 Don't worry, there's still some goofy new stuff, like Mario Van Peebles and his terrible Caribbean accent, or the strange technology he's using as a weapon against the shark. And hey, bonus! Respectable actor Michael Caine is here to play a cartoon character, shrug his way through a romance subplot, and collect a paycheck. 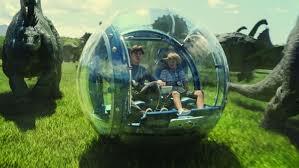 Trevorrow's Jurassic World is largely the same thing. It tries very hard to assure returning fans of its newfound pedigree, but stumbles at this by shamelessly invoking the image of a beloved original cast member (while JW has a statue of Richard Attenborough's John Hammond, The Revenge lingered on a framed memorial photo of Roy Scheider's Sheriff Brody). It brazenly ignores the middle sequels in an attempt to claw up to a place of artistic high ground it doesn't deserve. It unnecessarily connects the animals of the original to its plot (Ellen Brody and her family are haunted and stalked across the hemisphere by a shark out of...revenge for what Martin did to the original shark? The T-Rex from the original Jurassic Park is the same one that saves the day 20 years later?). And it has all the same kinds of new oddities as Jaws: The Revenge, in the form of Vincent D'Onofrio as the aforementioned cartoon character, an unnecessary romance bloomed from the non-chemistry of Chris Pratt and Bryce Dallas Howard, and all kinds of cool gadgets and tech, including Velociraptors sporting GoPro cameras on their headsets (!) and whatnot. It's staggeringly dumb, the effects are not good enough to be as proudly displayed as they are, and by the way...it's also kind of a secret Christmas movie?! 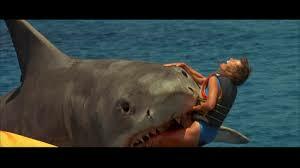 All things that can be said of Jaws: The Revenge. But having said all that, I can't help but find the fourth entries a lot more fun to watch. Heresy! Yes, I like Jurassic World better than The Lost World, because one is a stupid monster movie and the other is a meandering, aimless piece of contract obligation from all the best people from the original (Chrichton, Spielberg, Goldblum) that ends up being an overly long stupid monster movie anyway. I expected more from it. I'd say the same about the Jaws movies, too. The second one is such a slog because it's ultimately the same movie as the first one, minus Shaw and Dreyfuss, and it insists on leaning into the acclaim of the first film instead of the B-movie nonsense that the entire series will inevitably embrace. While The Revenge and Jurassic World are brazenly silly, I have an easier time swallowing them. tl;dr - Colin Trevorrow's firing, while probably a creative positive for the Star Wars franchise, looks bad from a publicity standpoint and further proves this "hire indie darlings for giant blockbusters" setup is a flawed idea. Also, the Jurassic Park movies and the Jaws movies are eerily similar cases of "sequel syndrome."